It may not feel like the sort of weather you want to be outside in playing netball, but your author has it on good authority that the London charities netball league is in full swing, so if you're looking for somewhere to play with a bit of history, you could contact the good folks at St Botolph without Bishopsgate, a living church in the heart of the City of London. 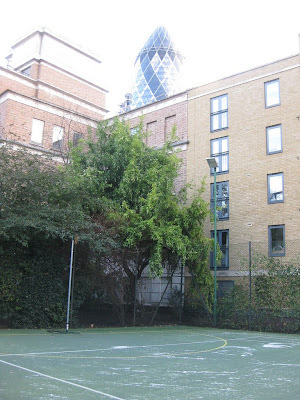 Their courts are in the gardens behind the church, which as the name suggests is just off Bishopsgate. The courts operate for netball only in the winter and for tennis and netball in the summer. Bookings are possible between 8 am and 9 pm, Monday to Friday in 1 hour sessions, between 12 noon and 2 pm as half hour sessions, starting on the hour and at half past the hour. Your author thinks a full court is around £40 an hour and floodlights might be available if you have enough £1 coins to feed the meter, but this isn't clear. Best ask when you contact them.